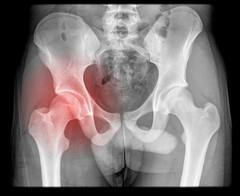 Chronic hip pain is a frequent compliant. It may be the result of athletic injuries, overuse, wear and tear arthritis, or may signal a more complicated ailment such as avascular necrosis. Prompt attention may avert a more progressive problem such as arthritis. A thorough history, physical examination, and when indicated appropriate diagnostic testing such as x-rays and MRI’s may elucidate the causative etiology of the hip pain. Easily treatable conditions such as bursitis may be missed without careful examination. There are several bursa surrounding the hip and are frequently overlooked when attention is only directed at x-rays. Athletes are more prone to overuse injuries and traumatic events may cause injuries to the joint or labrum surrounding the hip joint. Labral tears may be seen on MRI’s, however caution should be employed as not all MRI findings are symptomatic. Inattention to the history and clinical examination can focus attention on asymptomatic MRI findings. Many studies have confirmed that asymptomatic individuals may have MRI findings. Recent studies have shown the success rate with arthroscopic surgery for hip labral tears is disappointing. This may be related to a asymptomatic labral MRI finding, lack of surgical correction for the underlying problem with arthroscopic measures, or concomitant additional pathology that has yet to be addressed. Humans are completed, and often times many pain signals are present at once, and a surgical correction aimed at one problem cannot correct a multi-source problem. It is not uncommon to find a patient with degenerative joint disease (osteoarthritis) to have hip, knee, and spine involvement. Limping or antalgic posturing is a frequent etiology for symptomatic multi-joint complaints. Significant osteoarthritis and avascular necrosis (AVN) is readily identifiable on imaging studies. Therapeutic options to repair utilize Regenerative Medicine techniques to augment the healing response. Biologic therapy, including Platelet Rich-Plasma (PRP) and Stem Cell Therapy to facilitate this effect. The emergence of Regenerative Medicine to treat disorders that were previously without viable options to retard the degeneration of joints is a welcome adjuvant to medical care. Platelet-Rich -Plasma (PRP) and Stem Cell Therapy have been incorporated in the treatment of a variety of hip problems. Platelet-Rich-Plasma (PRP) has been used in muscle tears, tendinitis, bursa inflammation, and joint degeneration (osteoarthritis). Stem CellTherapy has been used to treat even more problematic situations such as severe joint osteoarthritis, non-union fractures, and vascular necrosis (AVN). Chronic hip disorders are amenable to Regenerative procedures, as an alternative to surgery or as valuable resource for initiating repair responses in acute and chronic hip disorders.